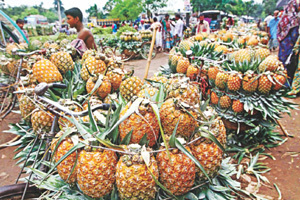 Over 1.25 lakh tonnes of pineapple are produced in Madhupur a year, making it one of the country’s biggest pineapple producing areas, according to Upazila Agriculture Officer Hazrat Ali. There, he found one Nazimuddin who had bought a pair of big-sized pineapple for Tk 70. On request, when he cut one, he’s utterly disappointed to find that the otherwise delicious fruit tasted like water. It didn’t even have the usual aroma of a naturally grown pineapple. “Why did you buy these pineapples?” asked the reporter. “Because these looked bigger and better,” answered Nazimuddin. The same is the case with most buyers. “Actually consumers everywhere like to buy big and bright pineapples,” said Rintu Miah, a wholesaler who had come to Jalchhatra from Pabna to buy the fruit. This tendency among the consumers is encouraging farmers to go for using more chemicals in farming the fruit. “I had to sale my chemical-free pineapple at Tk 10 apiece while a neighbour of mine sold his chemically grown fruits at Tk 20 to Tk 25,” said a pineapple grower. “They are making more money than I am. I might just have to follow their path now. What else can I do?” he said helplessly. Harmful chemicals such as Ethophen and Ethrel are widely used by the pineapple farmers in Madhupur region to give the fruits a bigger size and better look and to ripen immature fruits in order to make more profit. But the excessive use of these chemicals in fruits can cause vomiting, dizziness, liver and kidney complications and even cancer, according to local officials of the Department of Agricultural Extension (DAE). “If farmers want, they can use growth hormones in little amount before the plants start flowering,” said Agriculture Officer Hazrat Ali. “But most farmers use the chemicals indiscriminately and whenever they feel like. This is bad,” he added. DAE Deputy Director Abul Hashim of Tangail said they were holding different motivational and training programmes to create awareness among the local pineapple growers against the unprescribed use of chemicals.